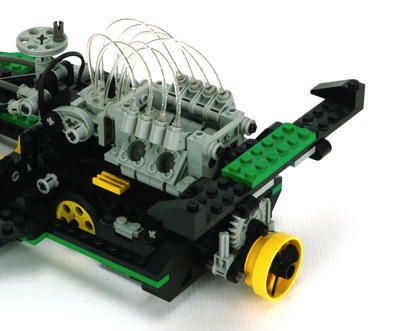 By 1996 the era of multi-model Universal Sets was largely ended. The few sets which were still to come, such as the 8456 Fiber Optic Multi Set, were no longer called Universal Sets but were usually introduced to showcase a new part or feature. 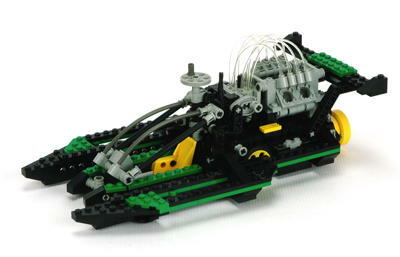 In the case of 8456, this new part is obviously the fiber optic element which is used in 5 innovative ways in the set. However, this set is much more than just an ode to the fiber optic element. Most of the 5 models are good enough to exist without the fiber optic element, and in fact most of them are good enough to exist as separate sets in their own right. This high level of quality across such a wide range of models makes this one of the very best universal sets. Obviously, each model uses the fiber optic element as a prime feature, but each model ties it to some other moving feature: an engine, or a brain. 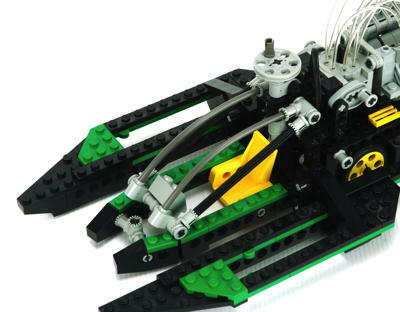 The 5 models span a wide range of subjects from vehicles representing land (drag racer), sea (hydroplane racer), and air (helicopter) to robots and (robotic) insects. 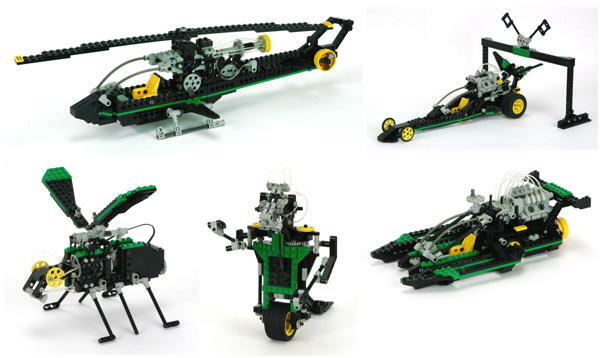 It is worth mentioning that although not the primary color, the use of green in this set is highly unusual in Technic. I must admit that prior to penning this page I had never actually built all 5 models. I chose the couple I thought looked the most interesting and tried those. Going back and documenting all of them was a pleasant surprise. Firstly, I was surprised at how many of the total parts each model used, each leaving only a handful behind. I was also surprised at how good at the models I previously thought looked uninteresting actually were. If you have the set, I highly encourage building them all. 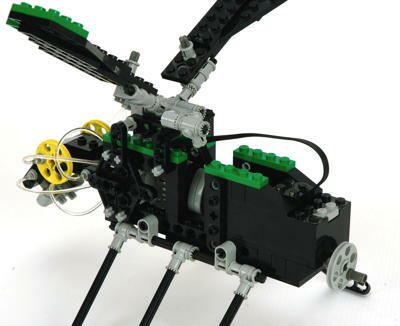 A helicopter is the "primary" model, or at least the one that uses the most parts. 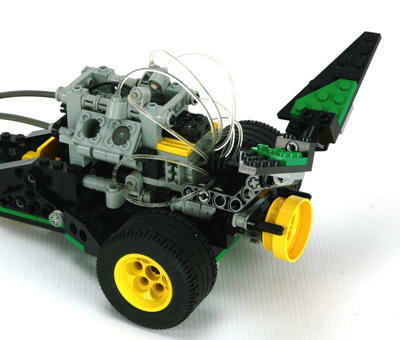 It is interesting to note that even though this is the main model it leaves some major parts unused such as the tires and piston engine parts. It's single feature is a rotating main rotor with simulated turbine engine. 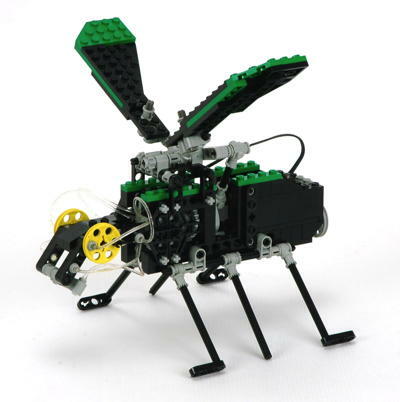 However, apart from the moving parts, this is among the best looking Technic helicopters which is saying something given how many there have been. I think it looks like a Bell Jet Ranger. The canopy is made convincingly from flex hoses. 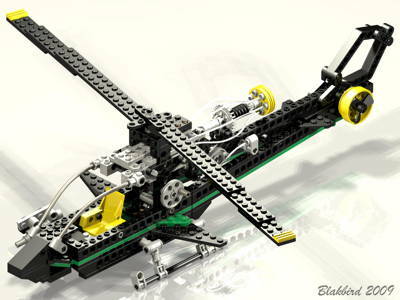 The main rotor is rotated by a crank on the side through some bevel gears at 1:1. A second set of bevel gears drives the fiber optic element at the same ratio. 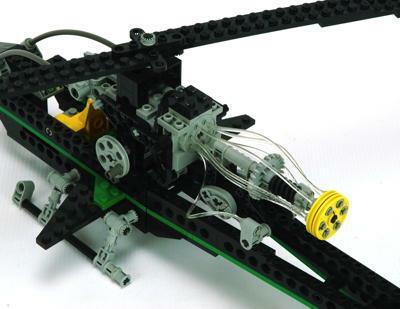 The fiber optics surround the rear of the turbine, and while the lights move, none of the simulated engine parts move. The second model is a Cylon Raider hydroplane racing boat, and despite being a bit bulky looks very much like one. The outboard sponsons and rear wing look excellent, and the propeller is geared to some hidden wheels. This is the only model with multiple geared functions. The V-4 engine is driven by some wheels hidden under the hull and also geared to the propeller which spins as the boat moves. The fiber optic elements seem to represent spark plug wires, but curiously there are 8 of them. I suppose a racing engine may have 2 plugs per cylinder. The driver's access hatch can be opened via a worm driven crank on the roof. The hatch itself is made from axles and flex hoses. Click for an animation of the hatch in motion. 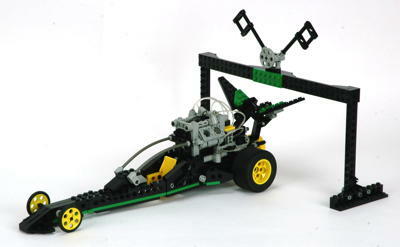 The third model is an American style drag racer with steam rollers on the back and pizza cutters on the front. There were enough parts left over in this model that the instructions also include a start/finish gate, although actually driving a top fuel dragster through such a gate would be disaster. The V-4 engine is driven by a single rear wheel (no differential). Obviously this should be a V-8, but given the size of the model this seems appropriate. The fiber optic elements are routed in such a way that they really can't be spark plug wires because they terminate all over the place. Perhaps they represent the flames shooting from the exhaust manifolds. 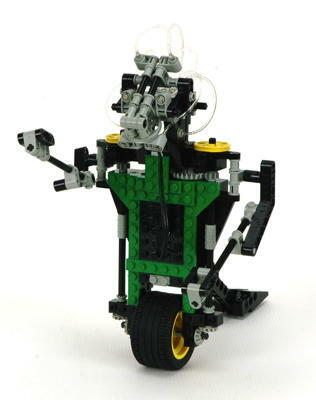 The 4th model is a mono-wheeled robot. This was long before the Segway, so perhaps this model represents some prescient prognostication on the part of the designer. In any case, since the model is totally unpowered it does not balance itself and I had to build a tail in back to hold it up for photography. 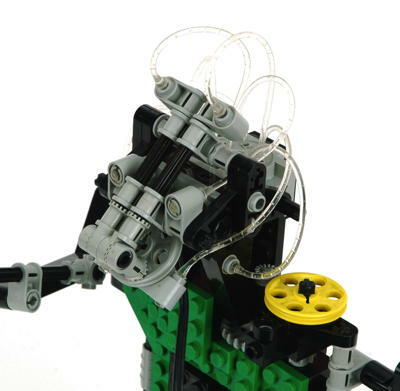 When building the model I was expecting the arms to be geared to the wheel, but they are not. They are fixed but pose-able. The positronic brain of this robot (or android) seems to have some exposed synapses firing. The fiber optic element is driven by the single main wheel. This animation is particularly lame, so I won't be offended if you skip it. The final model is an insect with a bulbous thorax and abdomen. Like the robot, the fiber optics seem to represent the brain, but the wings also flap. The legs are supported at an angle by toothed connectors under considerable bending stress. A crank at the rear of the abdomen powers a cam system which oscillates to flap the wings in time with the rotation of the fiber optic element. It works very well and makes this one of the more innovative models in the set. Click for an animation of the wings in motion.